Special Areas are the lands immediately around the water storages. Special and Controlled Areas are declared under the Water NSW Act 2014 and WaterNSW regulates certain activities in these areas through the Water NSW Regulation 2013. These are the lands immediately around the Warragamba, Upper Nepean, Woronora and Blue Mountains water storages. Fitzroy Falls Reservoir and part of Lake Yarrunga are an exception and are classed as restricted access. In the Warragamba catchment, the Special Area - No Entry extends for three kilometres from the top of the full storage water level in Lake Burragorang (formed by Warragamba Dam). In the Blue Mountains, Woronora and Metropolitan catchments, the Special Areas - no entry restrictions cover the entire catchments. Entry is not allowed in these areas. Fines up to $44,000 apply for people who are caught ignoring the restrictions in Special Areas. 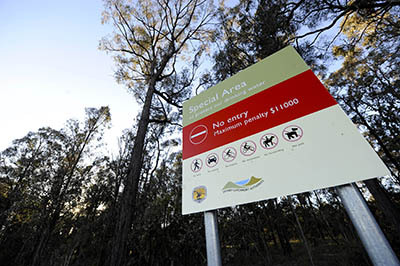 Regular surveillance and patrols of the Special and Controlled Areas, are conducted by WaterNSW, National Parks and Wildlife Service and NSW Police. These areas include the water storages and surrounding land of Fitzroy Falls Reservoir and part of Lake Yarrunga, and the second protection zone outside the â€œno entry zone around Lake Burragorang. Walking, camping, fishing, swimming and non-powered boating can be undertaken in these areas unless otherwise specified. Vehicles (including motorcycles and bicycles), horses, pets, powered watercraft and firearms are not allowed in these areas. The Upper Canal runs from Pheasants Nest Weir near Wilton to Prospect Reservoir over 60 kilometres across rural and suburban lands. The two Warragamba pipelines transfer water 27 kilometres between Warragamba Dam and Prospect water filtration plant. No entry is allowed in these areas.